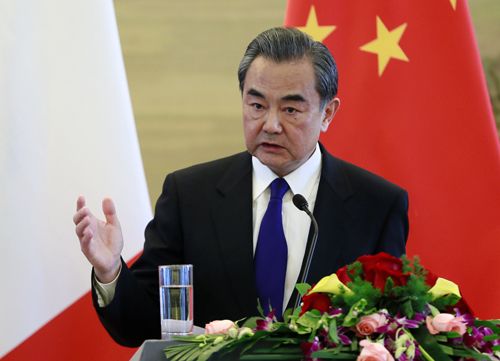 On April 14, 2017, when meeting the press with visiting Minister for Foreign Affairs and International Development Jean-Marc Ayrault of France after holding talks in Beijing, Foreign Minister Wang Yi made positive remarks on China-France relations. Wang Yi pointed out that Foreign Minister Jean-Marc Ayrault and I had friendly talks and reached broad consensus. We both believe that China-France relations have reached a new historical height with the care and promotion of the two heads of state. China and France have improved dialogue and cooperation mechanism in various fields and at all levels and achieved breakthroughs and innovations on practical cooperation and cooperation modes. Public opinion foundation was consolidated and close communication and coordination were achieved in international affairs. The Chinese side appreciates French government's respect for China's core interests and major concerns, and is willing to work jointly with France to maintain China-France comprehensive strategic partnership at a high level. Both sides agreed that we should make great efforts with more openness and positivity to strengthen cooperation in nuclear power, aerospace and aviation, third-party markets and green industry, well implement existing key cooperation projects, and expand cooperation in agriculture, food, health, finance and other fields, so as to achieve long-term mutual benefit and win-win results. The two sides agreed to further deepen China-France people-to-people and cultural exchanges and cooperation, give full play to the role of existing high-level people-to-people and cultural exchange mechanism, and provide more convenience and security guarantee for personnel exchanges and consolidate public opinion bases of China-France friendship. Both sides agreed that since the trends of multi-polarization and economic globalization are irresistible, both sides should continue to support the open and inclusive international trade system and multilateral cooperation framework, safeguard historic outcomes achieved at the UN Climate Change Conference in Paris, deepen cooperation in international anti-terrorism and security, and continue to play positive roles in peaceful settlement of regional hotspot issues such as the Syrian issue and the Palestinian-Israeli issue. The EU is a significant force in today's international arena. France is a core member of the EU. The Chinese side firmly supports the European integration process, and is willing to, together with EU members including France, jointly well prepare for the 2017 China-EU Leaders' Meeting and promote the in-depth development of four major China-EU partnerships. Wang Yi said that China sincerely wishes France a smooth election. We are glad to see that it has been a mainstream social consensus for all sectors of society in France to continue to uphold friendship toward China and strengthen cooperation with China. Regardless of the result of the election, the Chinese side will have full confidence in the development prospects of China-France relations. China stands ready to work along with France to continuously push bilateral relations for new progress.